· Jimmie Johnson won the 57th Annual Bank of America 500 NASCAR Sprint Cup Series race Sunday afternoon. For Johnson, it is his 78th victory in 537 NASCAR Sprint Cup Series races. · It is Johnson’s third victory and 13th top-10 finish in 2016. · It is Johnson’s eighth victory and 19th top-10 finish in 31 races at Charlotte Motor Speedway. · It is the 14th time in Johnson’s 15 year career where he has three or more wins in a season. 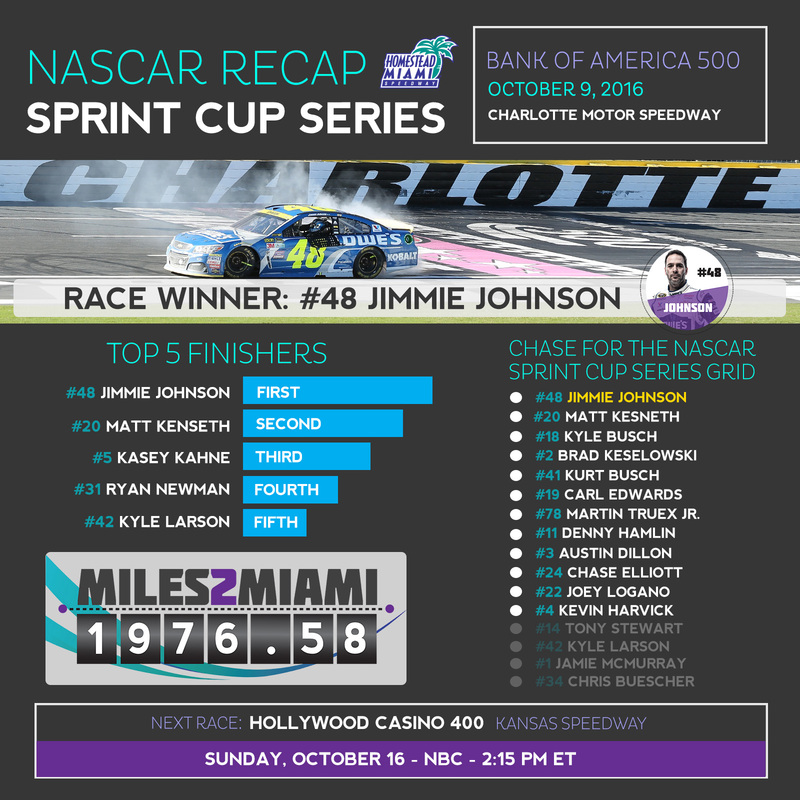 · With the victory, Jimmie Johnson becomes the first driver to advance to the Round of 8 of the 2016 Chase for the NASCAR Sprint Cup. · It is the first time Johnson advances to the Round of 8 of the Chase under the current format, which was instituted in 2014. Johnson’s last victory as a Chase contender came on November 3, 2013 at Texas Motor Speedway. · Matt Kenseth (second) posted his 19th top-10 finish in 35 races at Charlotte Motor Speedway. · It is Kenseth’s seventh top-5 and 15th top-10 finish in 2016. · Kasey Kahne finished third on Sunday, giving him his 14th top-10 finish in 26 races at Charlotte Motor Speedway. · It is Kahne’s third top-5 and 10th top-10 showing through 30 races this season. · In 15 Sprint Cup Series starts at Homestead-Miami Speedway, Johnson has four top-5 and 10 top-10 finishes. Johnson has also celebrated six Sprint Cup Series championships at Homestead Miami Speedway (2006-10 and 2013). · Following Sunday’s Chase for the NASCAR Sprint Cup race at Charlotte Motor Speedway, there are now only 1,976.58 #Miles2Miami. The 2016 Chase for the NASCAR Sprint Cup will culminate at Homestead-Miami Speedway with the Ford EcoBoost 400 championship race on November 20. · Below are the current standings in the 2016 Chase for the NASCAR Sprint Cup following the first race in the Round of 12. Following his victory at Charlotte Motor Speedway, Jimmie Johnson is the only driver who has punched his ticket into the Round of 8. Johnson leads the points standings by five points over Matt Kenseth. 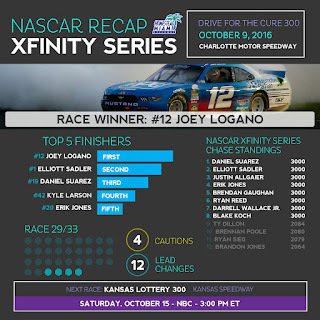 · Joey Logano won the 35th Annual Drive for the Cure 300 presented by Blue Cross Blue Shield of North Carolina XFINITY Series race at Charlotte Motor Speedway Sunday afternoon. It is his 27th victory in 158 NASCAR XFINITY Series races. · It is Logano’s second victory and 11th top-10 finish in 2016. 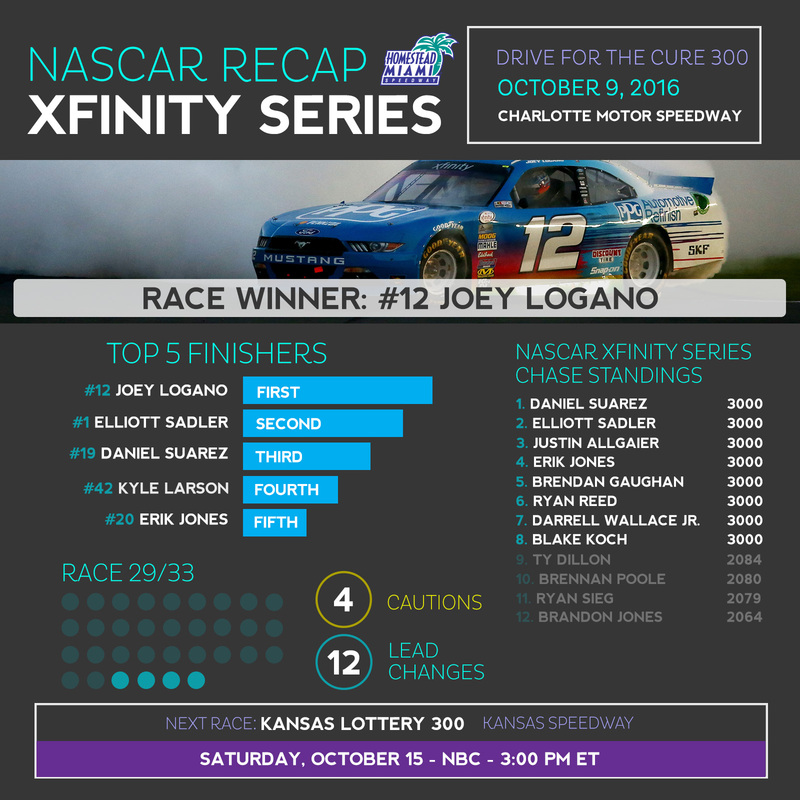 · It is Logano’s second victory and ninth top-10 finish in 13 races at Charlotte Motor Speedway. · Elliott Sadler (second) posted his ninth top-10 finish in 20 races at Charlotte Motor Speedway. It is his 26th top-10 finish in 2016. · Daniel Suarez (third) posted his third top-10 finish in four races at Charlotte Motor Speedway. · Erik Jones (fifth) was the highest finishing rookie. · Daniel Suarez, Elliott Sadler, Justin Allgaier, Erik Jones, Brendan Gaughan, Ryan Reed, Darrell Wallace Jr. and Blake Koch are the drivers who will advance to the Round of 8 in the NASCAR XFINITY Series Chase. The four drivers who have been eliminated from the Chase are Ty Dillon, Brennan Poole, Ryan Sieg and Brandon Jones. · Blake Koch grew up in West Palm Beach. He went to Royal Palm Beach High School as well as Northwood University in West Palm Beach.